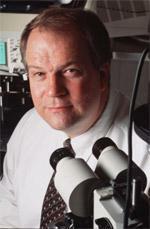 Joseph A. Izatt is a Professor of Biomedical Engineering, Associate Professor of Ophthalmology. Dr. Izatt holds appointments in both the Department of Biomedical Engineering and the Department of Opthalmology. Izatt is also the Director of the Laboratory for Biophotonics in the Fitzpatrick Center for Photonics and Communications. Izatt's research interest include biomedical optics, spectroscopy, and imaging; laser-tissue interactions; optical and ultrasonic signal processing; novel methods for high-resolution, and minimally invasive medical imaging and tissue characterization. The use of metal nanoparticles as contrast agents with photothermal OCT technology could lead to a host of potential clinical applications.